The fundamental things apply … As time goes by. 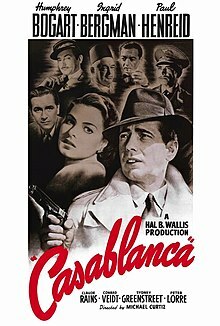 Casablanca is a 1942 film about an American expatriate owner of an upscale club and gambling den in the Moroccan city of Casablanca who meets a former lover, with unforeseen complications. Directed by Michael Curtiz. Written by Julius J. Epstein, Philip G. Epstein, and Howard Koch, based on the play Everybody Comes to Rick's by Murray Burnett and Joan Alison. Ranked #67 in the American Film Institute's list of the top 100 movie quotations in American cinema. [repeated line] I stick my neck out for nobody. [after inspecting a dossier about him] Are my eyes really brown? [on Captain Renault] Oh, he's just like any other man, only more so. [about Ugarte] I'm making out the report now. We haven't quite decided whether he committed suicide or died trying to escape. Oh, please, monsieur. It is a little game we play. They put it on the bill, I tear up the bill. It is very convenient. Well, Rick is the kind of man that…well, if I were a woman, and I were not around, I should be in love with Rick. But what a fool I am talking to a beautiful woman about another man. I have no conviction, if that's what you mean. I blow with the wind, and the prevailing wind happens to be from Vichy. [to Rick, in Paris as the Germans are invading] I love you so much. And I hate this war so much. Oh, it's a crazy world. Anything can happen. If you shouldn't get away, I mean, if something should keep us apart, wherever they put you and wherever I'll be, I want you to know that…I Love you. Kiss me as if it were the last time. You want to feel sorry for yourself, don’t you? With so much at stake, all you can think of is your own feelings. One woman has hurt you, and you take your revenge on the rest of the world. You’re a coward and a weakling. Rick: If I gave you any thought, I probably would. Ugarte: But why? Oh, you object to the kind of business I do, huh? But think of all those poor refugees who must rot in this place if I didn't help them. Well that's not so bad. Through ways of my own, I provide them with exit visas. Rick: For a price, Ugarte. For a price. Rick: [about his club] It's not for sale. Rick: I don't buy or sell human beings. Ferrari: My dear Rick, when will you realize that in this world today, isolationism is no longer a practical policy? Renault: How extravagant you are, throwing away women like that. Someday they may be scarce. You know, now I think I shall pay a call on Yvonne. Maybe get her on the rebound. Hmm? Rick: When it comes to women, you're a true democrat. Renault: I've often speculated on why you don't return to America. Did you abscond with the church funds? Did you run off with a Senator's wife? I like to think that you killed a man. It's the romantic in me. Renault: Rick, there are many exit visas sold in this café, but we know that you've never sold one. That is the reason we permit you to remain open. Renault: That is another reason. Carl: I have already given him the best. Knowing he is German, he would take it anyway. Strasser: How about New York? Ilsa: [whispered] Play it, Sam. Play As Time Goes By. Ilsa: I'll hum it for you. [Ilsa hums two bars. Sam starts to play] Sing it, Sam. Lyrics and Music by Herman Hupfeld (1931). Bolded section ranked #28 in the AFI's list of the top 100 movie quotations; it is often misquoted as "Play it again, Sam." Renault: You mustn't underestimate American blundering. I was with them when they "blundered" into Berlin in 1918. Rick: That was some going-over your men gave my place. We just barely got cleaned up in time to open. Renault: Well, I told Major Strasser that he wouldn't find the letters here, but I told my men to be especially destructive. You know how that impresses Germans. [leans in] Rick. Have you got those letters? Renault: [smiling] Hmmph. Serves me right for asking a direct question. The subject is closed. Strasser: [after Laszlo leads the band in playing the French national anthem] You see what I mean? If Laszlo's presence in a cafe can inspire this unfortunate demonstration, what more will his presence in Casablanca bring on? I advise that this place be shut up at once. Renault: But everybody's having such a good time. Strasser: Yes, much too good a time. The place is to be closed. Renault: But I've no excuse to close it! Renault: [to croupier] Oh, thank you very much. [announcing to the room] Everybody out at once! Rick: Your unexpected visit isn't connected by any chance with the letters of transit? Seems as long as I have those letters, I'll never be lonely. Ilsa: [smiles] I wish I didn't love you so much. Bolded section ranked #5 in the American Film Institute's list of the top 100 movie quotations in American cinema. Laszlo: You might as well question why we breathe. If we stop breathing, we'll die. If we stop fighting our enemies, the world will die. Laszlo: You know how you sound, Mr. Blaine? Like a man who's trying to convince himself of something he doesn't believe in his heart. Each of us has a destiny - for good or for evil. Laszlo: I know a good deal more about you than you suspect. I know, for instance, that you're in love with a woman. It is perhaps a strange circumstance that we both should be in love with the same woman. The first evening I came to this café, I knew there was something between you and Ilsa. Since no one is to blame, I - I demand no explanation. I ask only one thing. You won't give me the letters of transit. All right. But I want my wife to be safe. I ask you as a favor, to use the letters to take her away from Casablanca. Laszlo: Apparently you think of me only as the leader of a cause. Well, I'm also a human being. Yes, I love her that much. Renault: That is my least vulnerable spot. Rick: Now, you've got to listen to me. Do you have any idea what you have to look forward to if you stayed here? Nine chances out of ten, we'd both wind up in a concentration camp. Isn't that true, Louis? Rick: I'm saying it because it's true. Inside of us, we both know you belong with Victor. You're part of his work, the thing that keeps him going. If that plane leaves the ground and you're not with him, you'll regret it. Maybe not today, maybe not tomorrow, but soon and for the rest of your life. Rick: We'll always have Paris. We didn't have it before...we'd...we'd lost it until you came to Casablanca. We got it back last night. Rick: And you never will. But I've got a job to do too. Where I'm going, you can't follow. What I've got to do, you can't be any part of. Ilsa, I'm no good at being noble, but it doesn't take much to see that the problems of three little people don't amount to a hill of beans in this crazy world. Someday you'll understand that. Now, now. Here's looking at you, kid. Bolded section ranked #43 in the American Film Institute's list of the top 100 movie quotations in American cinema. Rick: There's something you should know before you leave. Laszlo: Mr. Blaine, I don't ask you to explain anything. Rick: I'm going to anyway because it may make a difference to you later on. You said you knew about Ilsa and me. Rick: What you didn't know was that she was at my place last night when you were. She came there for the letters of transit. Isn't that true, Ilsa? Rick: She tried everything to get them and nothing worked. She did her best to convince me she was still in love with me but that was over long ago. For your sake she pretended it wasn't and I let her pretend. Laszlo: Thanks. I appreciate it. Welcome back to the fight. This time I know our side will win. Are you ready, Ilsa? Ilsa: Yes, I'm ready. Good-bye Rick. God bless you. Rick: You better hurry. You'll miss that plane. Rick: [drawing a pistol] Get away from that phone! Strasser: I would advise you not to interfere. Rick: I was willing to shoot Captain Renault and I'm willing to shoot you. Strasser: [into the phone] Hello? Rick: Put that phone down! Strasser: Get me the radio tower. Renault: Major Strasser has been shot. [pause] Round up the usual suspects. 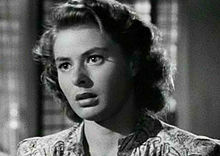 Bolded section ranked #32 in the the American Film Institute's list of the top 100 movie quotations in American cinema. Renault: I think perhaps you're right. [he pours the Vichy water into a glass, but then sees its label; with a look of disgust, he quickly drops the bottle into a trash basket and kicks it over] It might be a good idea for you to disappear from Casablanca for a while. There's a Free French garrison over at Brazzaville. I could be induced to arrange a passage. Rick: [Rick walks off with Renault across the wet runway into the mist] Louis, I think this is the beginning of a beautiful friendship. Bolded section ranked #20 in the American Film Institute's list of the top 100 movie quotations in American cinema. While the lines "Play it" and "Play it, Sam" both appear in the film, the line "Play it again, Sam" never appears in the film. Mysterious City of Sin and Intrigue! As big and timely a picture as ever you've seen! You can tell by the cast it's important! Gripping! Big!